Terri Frampton LaPorte (or possibly Mike Oster ? 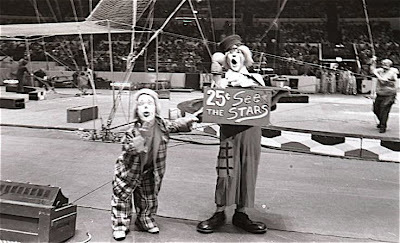 )and Eugene"Pidge" Pidgeon on the Ringling Bros. and Barnum & Bailey Red Unit in (or around) 1978. 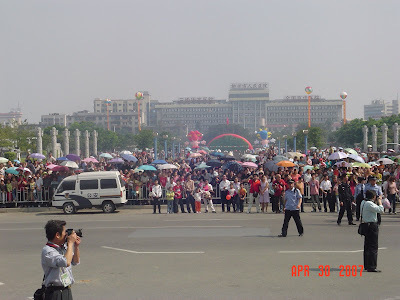 An amateur snapshot from far away but it looks to me like Ernie "Blinko" Burch. Raffaele de Ritis has just posted THE CLEAREST video that I have yet seen of the opening moments of Chester "Bobo" Barnett's act. It's just the beginning with the little car, before he gets the dogs on the turntable or plays "Peg O' My Heart" on the trumpet, performed in Berlin and filmed for a newsreel. An old business card from Chuck Burnes. Chuck.. .are you out there? 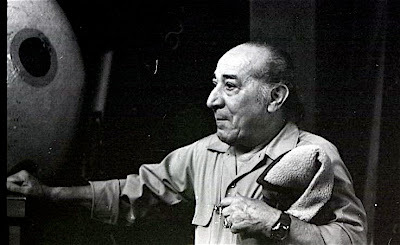 Can you tell us about the artist? 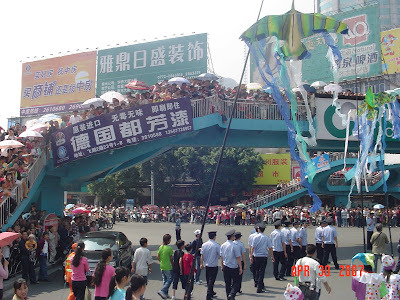 A very happy First of May to one and all. 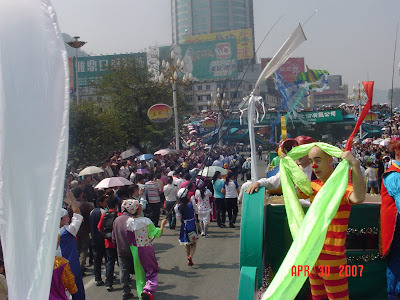 To celebrate, here are some photos from the biggest First of May party that I was ever invited to... the opening parade of The AEMI International Clown Festival in Liuzhou, China on April 30th, 2007. 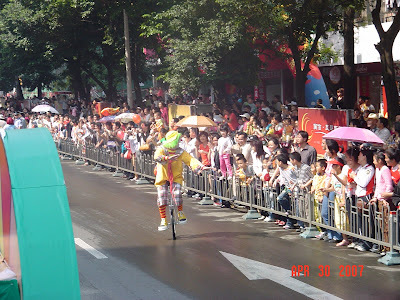 Jesse on the left, Andrew Scharff on the right and Gary Spear out front on the unicycle. Jesse Dryden, Andrew Scharff and Todd Zimmerman. Brother Greg and Papa Lou would like to direct your attention to the new banner ad at the top of the right hand side of the page. 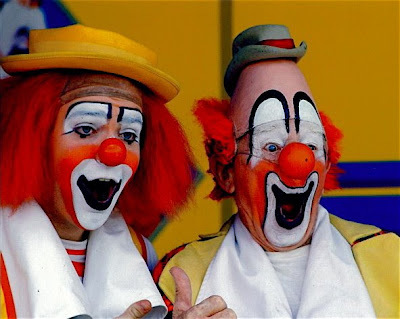 If you were a student or faculty in any of the 30 illustrious years of the Ringling Bros. and Barnum & Bailey Clown College we'd like to invite you to join us in Baraboo this September. 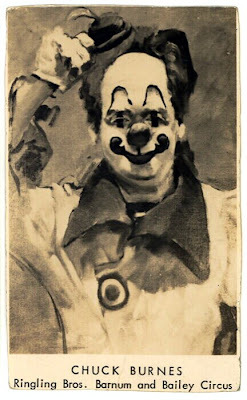 New York Downtown Clown would like to thank all the performers of our second year. 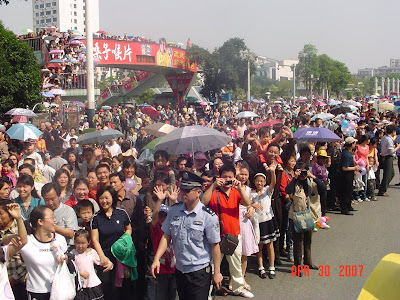 Without each of their talents, innovations, and hard work, there would be no show on the third Monday of every month. 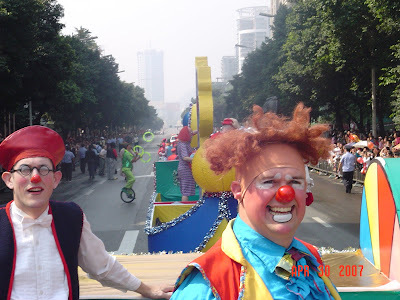 The amazing clowns of New York City are brave, poetic, unique, and funny. 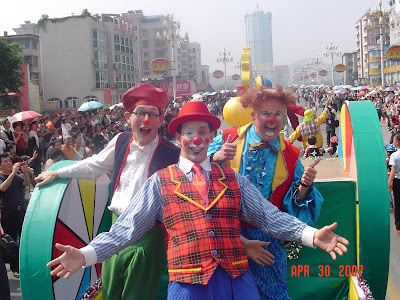 New York Clowns are a strong community and the following Nominees represent some of the leaders of clown education, performance, and production from this past year. 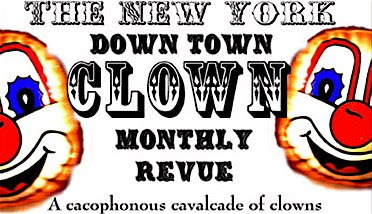 The Audience Choice Awards go to the clown or clown group who received the most audience votes over the past year at The New York Downtown Clown Revue performances in a specific category. 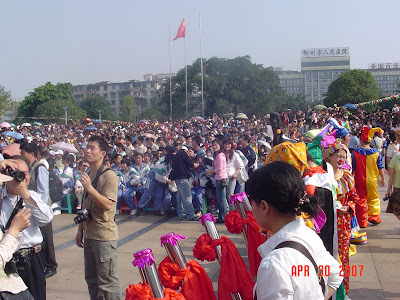 The four Nominees are the top four most voted for in each category. 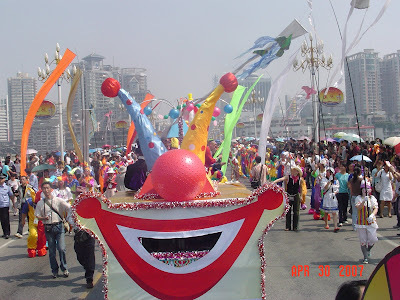 The clown or clown group with the most votes in a category is the winner of that category and will be announced at the Golden Nose Awards Ceremony on May 19th. 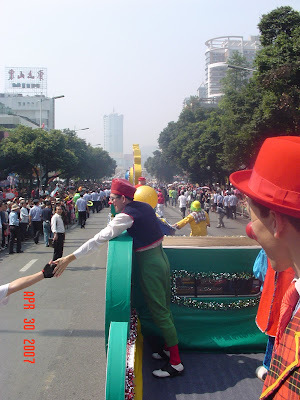 Clown Achievement of The Year goes to the company or group that has accomplished an outstanding clown achievement. 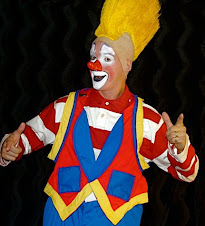 This award goes to large scale achievements that serve the clown community as a whole or to achievements of clown work for commercial/mass appeal. Nomination and Award are at the discretion of New York Downtown Clown producers. 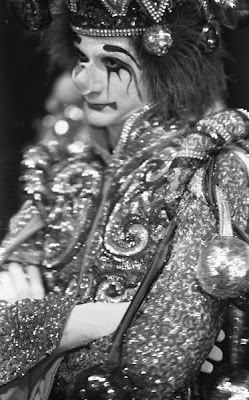 To be eligible for the Clown of The Year category, the clown must have appeared on stage or in a film of the current year's Clown Revue. 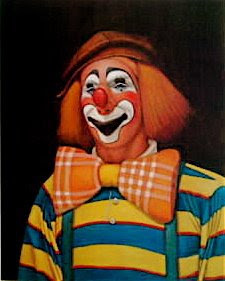 This award is for individual clowns who work professionally and artistically and have also made contributions to the larger clown community through education, mentorship, directing, producing, and/or other forms. Nomination and Award are at the discretion of New York Downtown Clown producers. 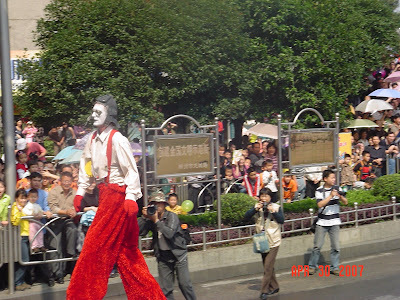 Moshe Cohen performed in the September Clown Revue and is nominated as 2008 Clown of The Year for his work as Mr. Yoowho, his teachings of Zen and Clown, and his involvement with Clowns Without Borders USA. 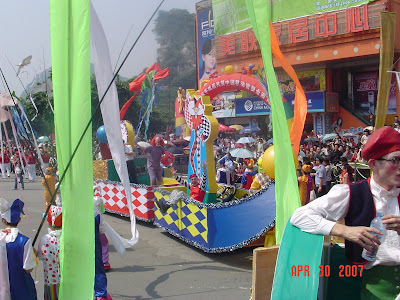 Mark Gindick, whose Happy Hour films were featured in the October Clown Revue is nominated for 2008 Clown of The Year for his work on Big Apple Circus where he shared the role of Grandma, his teaching work at SUNY Purchase, and his coaching with Assortment of Fools. 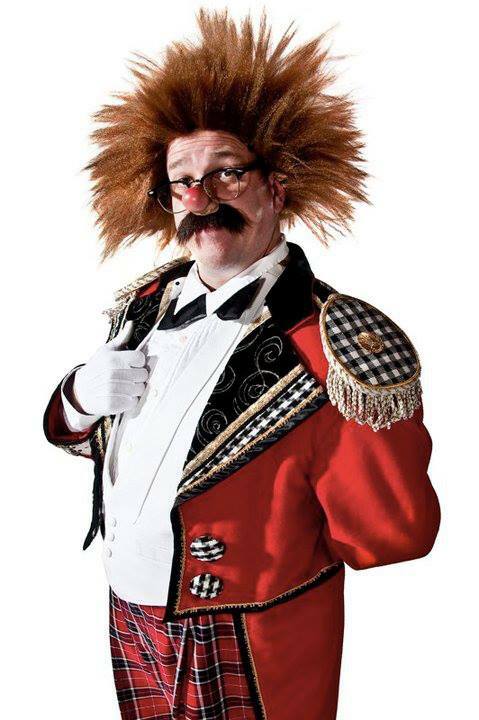 Jef Johnson performed in the August Clown Revue and is nominated for 2008 Clown of The Year for his work on the international touring production of Slava's Snowshow, and his development of clown and clown training through Jef Johnson's Clown Lab. 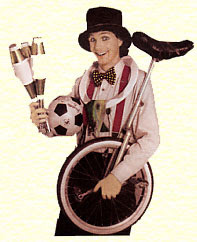 Keith Nelson performed in the February Clown Revue and is nominated for 2008 Clown of The Year for his work as Kinko the Clown, the performance initiatives he has co-created through his company Bindlestiff Family Circus, and his teaching work at New York Circus Arts Academy, Wagner College, and several youth programs. 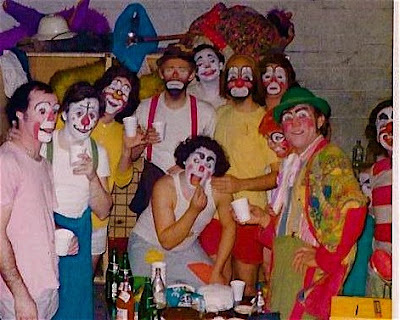 The Brick Theater, producers of the New York Clown Theatre Festival will receive this year's Clown Achievement of The Year Award. Get Your tickets now to the only Clown Awards Show in the Country! Another view of the surprise birthday party from 1977, which judging from the body language and position of Bobby and Frosty hands looks as though it was from Bobby's 68th birthday. No name, no date, no show. Anyone out there recognize him (or his dog)? A Harry Atwell photograph of Poodles Hanneford and his brother-in-law, Percy Clark in the late 20s/early 1930s. BEN SAID: Who Was This Man? 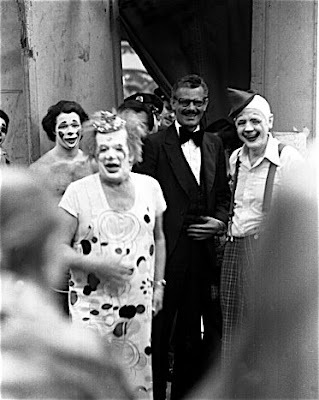 The mysterious Ben Said, Gunther Gebel Williams right hand man (and whose right hand was mythically restored by Frosty Little and some Sea-Breeze) who was not a Ringling clown but dressed in the Alley, where he was a fixture in the 1970s. If you were on the Red Show "back in the day", Mitch Freddes and I want your Ben Said stories!!! 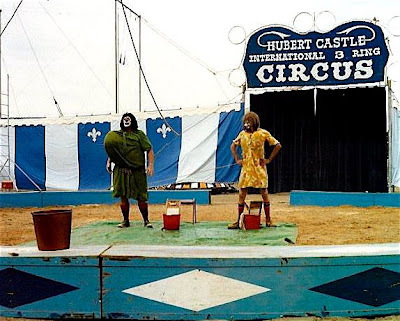 Billy Vaughn and Gene Randow performing the Washer Woman Gag on the Hubert Castle International Three Ring Circus. 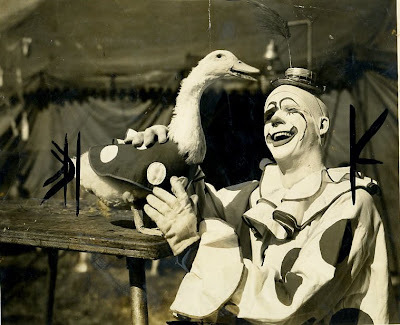 Harry Dann and his duck, Horatio. 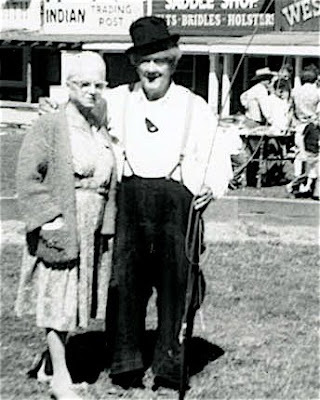 The legendary Edwin "Poodles" Hanneford and an unidentified friend taken somewhere between 1956 and 1967 during his long residency at Frontier Town in North Hudson, NY. 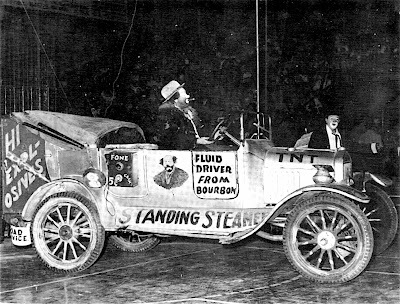 Rex "Count de Boxcar" Young performing his comedy car act with an assist from Poodles Hanneford in this undated photo which looks to have been taken on a Shrine date. Jim Tinsman, Bobby Kay, Col. John Herriot and Glen "Frosty" Little at a surprise backstage birthday party in 1977. RBBB Blue Unit Alley, 1973. 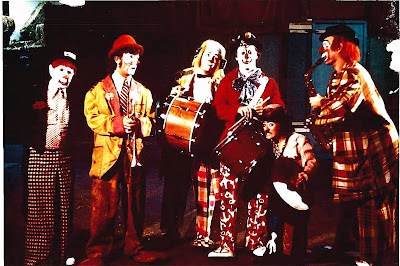 From right to left: Rick Cobbin, Ray Lesperance, Chris Bricker, Dennis Hall, Paul LaPan, Bob Zrack, Don Debelli, Sandy Severini, Laslo Donnert, Earl Chaney and, in front, Ron Severini in whiteface. 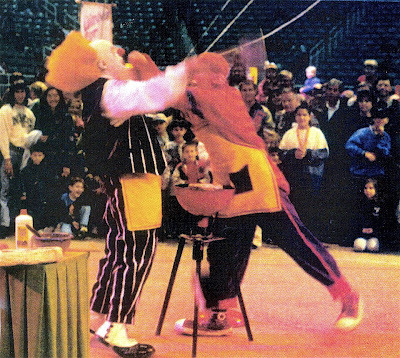 Benny Schultz and I (in whiteface) performing the Barbecue Gag in Ring Two during what was then called "The Three Ring Adventure" pre-show in Grennsboro, NC in the winter of 1999.
brave struggle with cancer at the young age of 53.
made you feel like his best friend when you were with him. book. 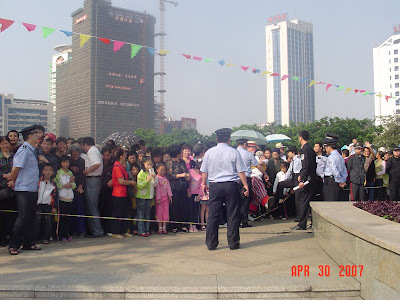 And the audiences came in droves (and loved it!) time and again. 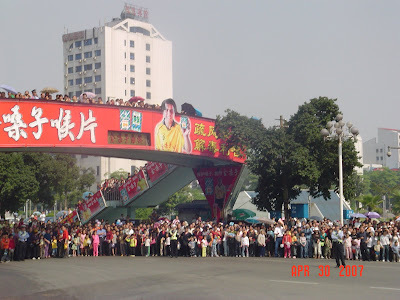 There are a couple of articles about his passing here and here. could sure use a laugh right now. VALERY SEREBRIAKOV & STANISLAV SHCHUKIN: "Water"
Video of Valery Serebriakov and partner Stanislav Shchukin. 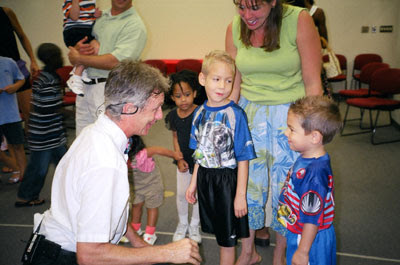 Valery was the father of the Valery who performed recently with the Big Apple Circus. 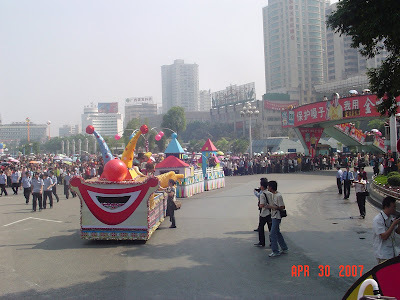 He was a very funny clown. 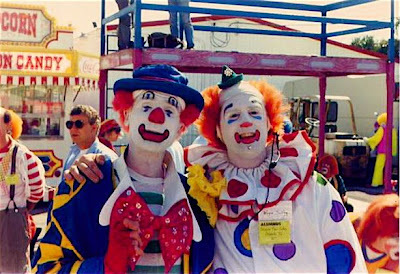 Bill Witter and Wayne Sidley at the Ringling Bros. and Barnum & Bailey Clown College 20th Anniversary Reunion in Venice, FL in 1987. From left to right: Swede "H.C." Johnson, Tommy Liebel, Kevin "Roofus T. Goofus" Bickford Ray Lesperance, Antonio Hoyos and Billy Vaughn. 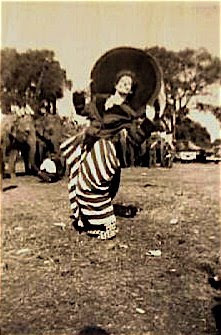 Published Saturday, April 26, 2008 at 4:30 a.m.
SARASOTA — Roberta "Berta" Ballantine was a showgirl in the Ringling Bros. and Barnum & Bailey Circus and her husband was one of the guiding forces of the circus's famed Clown College, but her greatest claim to fame may be a controversial book she completed shortly before her death questioning whether William Shakespeare wrote many of his most famous plays. Ballantine, 85, who died April 17 from a ruptured blood vessel, spent 28 years researching and writing a book that suggests that most, if not all, of the works attributed to Shakespeare were written by fellow English playwright Christopher "Kit" Marlowe. In "Marlowe Up Close: An Unconventional Biography with a Scrapbook of His Ciphers," she claimed Marlowe wrote the plays and sonnets while living under an assumed name in Italy long after his reported death in England in 1593 at age 29. She contended that many of the opening lines of Shakespearean plays are anagrams written by Marlowe revealing his authorship and his loyalty to Queen Elizabeth I, who kept his secret. Anagrams, or rearranging the letters in words to form new words, were popular during Elizabethan times, Ballantine said. She also noted that Marlowe, a prolific writer and former spy for the monarchy, could not claim ownership of "Romeo and Juliet," "King Lear" and "Julius Caesar," among other works attributed to Shakespeare, because he faced persecution in England for his religious views if his whereabouts were known. Ballantine was not the first to suggest that some of Shakespeare's works may have been ghost-written. Although scholars have traditionally debunked such claims, Ballantine hoped her extensive research would prod them to reconsider. 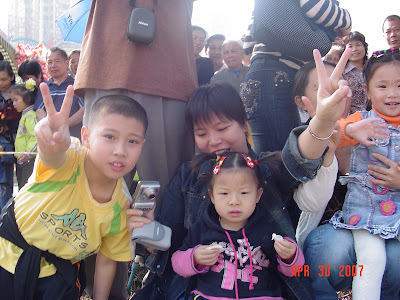 She also hope to stir discussion by seeing her 688-page book translated into a movie or television documentary. Born May 31, 1922, in California, Roberta Light pursued acting after receiving an English literature degree with high honors from Pomona College in 1943. 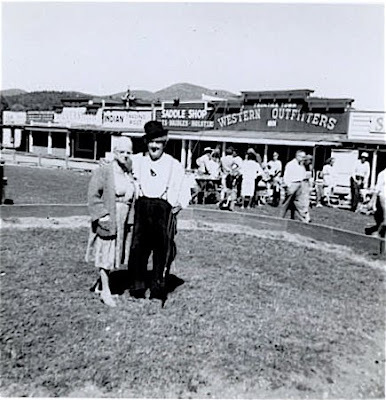 She enrolled in a drama school in New York City and was working as a showgirl in Billy Rose's Diamond Horseshoe nightclub when she was offered a job with the Ringling circus. 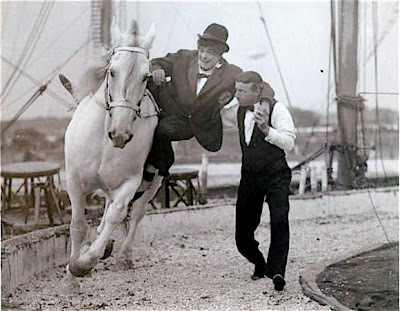 As the circus's "Snow Queen" in 1948, the statuesque, 6-foot-tall showgirl wore a silver sequinned outfit and white-plumed headdress and rode in circus arenas throughout the country on a gilded carriage pulled by six white horses, her family said. 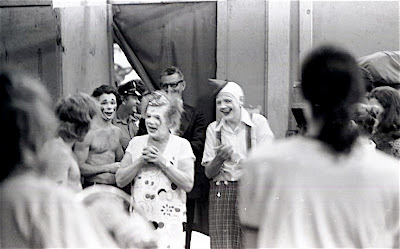 That same year, she met her future husband, Bill Ballantine, a writer and illustrator who joined the circus a year earlier as a clown to write about his experiences. 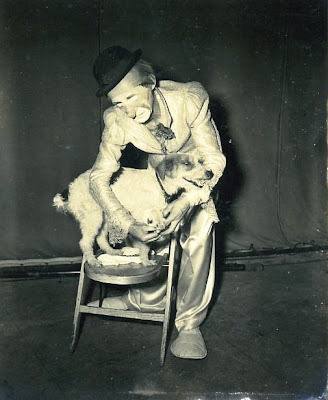 Bill Ballantine went on to become one of the deans of the circus' Clown College for several years in Venice. 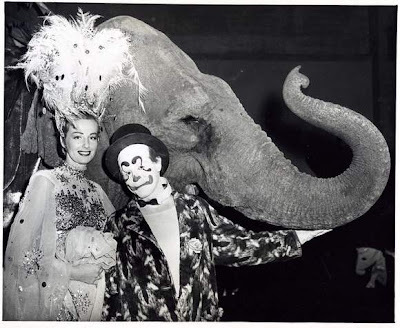 The couple wed in 1948, and Roberta left the circus after a year to start a family. Years later, her college interest in Elizabethan authors was rekindled by a book about Marlowe and her husband's hunch that an inscription on Shakespeare's tomb was an anagram. Bill Ballantine had been trained in codes while working for the Office of War Information during World War II. That led Roberta Ballantine to set out to decipher the opening lines of the works attributed to Shakespeare while gathering information about Marlowe's life from numerous European sources. She and her husband moved to Venice in the early 1970s, and later moved to Sarasota. Roberta Ballantine moved to Vermont last year to be closer to family following the death of her husband in 1999. She is survived by three daughters, Bridget Lambert of Orange, Calif., Tia Ballantine of Oakland, Calif., and Lulu Wootten of Craftsbury Common, Vt.; two sons, Toby of Roslyn Heights, N.Y., and Tim of Alstead, N.H.; 15 grandchildren; three step-grandchildren; eight great-grandchildren and three step-great-grandchildren. 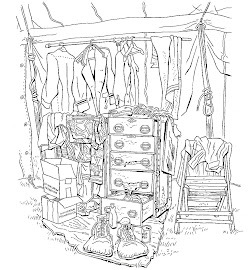 Memorial donations may be made to Showfolks of Sarasota, 5204 N. Lockwood Ridge Road, Sarasota, FL 34232; or the Craftsbury Community Care Center, 1784 E. Craftsbury Road, Craftsbury, VT 05826. Jeff Loseff by Jim Howle, undated. Few people remember Tom Dougherty's brief stint replacing David Johansen as lead singer of the New York Dolls. Dougherty toured with the briefly reunited Dolls for a few weeks in 1980. 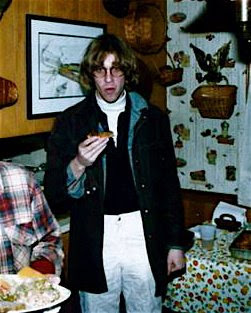 Here, to prove his New York City street cred and in a prime example of pure punk rock savagery, Tom Dougherty is seen eating a warm brownie in Jeff Darnell's parents' kitchen.